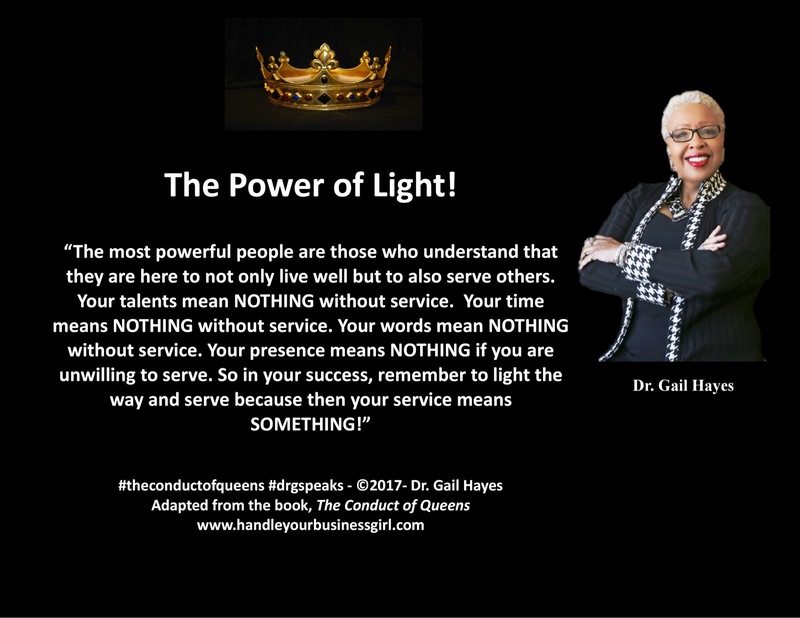 Dr. Gail Hayes & Dr. G Speaks! | "Join Dr. Gail in the Handle Your Business Girl Empowerment Zone!" I know it’s been a while since you’ve heard from me but I’ve been busy planning lots of new surprises. Number one, I will be posting more regularly. Been in the midst of many changes so you and I can spend more time together! So, let’s begin! I am a world traveler and as a military brat and former military spouse, I’ve lived on 3 continents. But now, I want to take you with me! Are you ready? If not, get your passport because we take the first trip on September 2-7, 2019! MAKE YOUR MARK! – Using your writing to “make your mark” in the marketplace. WRITE IT RIGHT – it’s time to finally write that book!!! Contact us at melinda@professionaldevelopmentjourneys.com or call Action Travel at (336) 584-8747 for more information. Tell them Dr. Gail sent you and you’ll receive a SPECIAL gift from me on the trip. See you onboard!!! “Right foot first Gail,” my mother’s voice cut through the soulful music. I was so caught up in the rhythm that I was not following instructions. I didn’t even feel it when I stepped on my mother’s foot. It was interesting watching her hop on one foot as she made her way to our sofa. I had never seen my mother smile and display such passion as when I asked her to teach me to dance. Now, this was not the wiggling and twisting dancing of my day. It was the “hand dancing” of her day. She was a teenager of the 1950’s and during that time the men would swing, twirl and lift the women off the floor as if they weighed only 15 lbs soaking wet! I loved watching the “swing” dancing on old television programs and I was determined to learn. What I didn’t know was that my mother was not only teaching me to dance, she was also teaching another vital life lesson. As the first born of seven children, I was born into leadership. I followed her instructions well and she often left me in charge when she had to leave us. I was accustomed to leading and helping her to care for my younger siblings. “You have got to learn to follow. When you dance with a boy, he has to lead. I know that may be hard for you to hear, but it’s just the way it is. You’ll learn. I promise,” she said. As she sat down and rubbed her sore foot, she laughed until she wept. I remember tears rolling down her cheeks as she beckoned for me to sit beside her. Her hug was my comfort but she was right. I didn’t particularly like the fact that I couldn’t lead. I did learn to dance with my mother. And I also learned another lesson. Not only could I lead, but I learned to follow. I stopped stepping on Mom’s toes and followed her as we danced the dance in beautiful rhythmic steps. Together, we were poetry in motion; switching between leading and following each other! If one is to become successful, one must also learn to follow. Success requires balance. One must learn and be open to new ways of doing old tasks. There are times when you lead. There are times when you must follow. If you want Success to abide with you, then you have little choice but to learn how to dance the dance! Many things have happened in my life that appeared to be negative but now I see that they were necessary for my life’s tapestry. They were less than what I deserved. The cut was not tailor made for me. The texture didn’t flow with my movements. The color didn’t suit me and the length was out of proportion and unflattering. As negative as this sounds, these happenings painted my present with glorious possibilities and I see my future filled with luminous, delicious color. I am grateful I experienced every moment. Remember this…You cannot drive forward looking in the rear view mirror. If you do, you can miss your exit to destiny. Yes, there are times when looking back can help us, but we must accompany our looking back with wisdom. When we glance into our past, we cannot have regrets about what we believed we missed. If we missed it, it was probably not something we needed in our lives. Our “coulda, shoulda, woulda” blues cannot help us navigate our future and walk in destiny. Hindsight is 20/20 when we use the information to produce wisdom. So, handle your business because destiny awaits you! Visit me on the web in the Handle Your Business Girl Community! If you are to be a wise ruler, you must understand one of the fundamental principles of reigning. You must accept the real and authentic you and all the beauty and power that comes with it. Authenticity, although an asset, is not easily won. Mines set to sabotage you from wholeness fill Life’s battle ground and there are times when you must fight to collaborate this elusive ally. The best way to win this battle is to understand the power of self control and self acceptance. When you understand and embrace who you are, focus becomes an integral part of your landscape. It invites Authenticity to hold you in his arms and guide to you a place called Queendom. It then becomes easier to guard your borders and to “rule yourself” without excuse. And that my sister…is a great place to be! The first ruling principle from the book, The Conduct of Queens is understanding who you are and learning to accept that awesome woman called you. When you don’t accept who you are, that insecure behavior will show up in EVERYTHING else that you do. It will show up even if you try to control it. It will come out in your language; in your actions and even in your attitude. The harder you try, the more it will show up! It will spill over into every area of your life…without your permission! If you’re not comfortable in your own skin, you will take your insecurity out on other Queens. And when you do, other Queens will see this as a declaration of war!!! So, it’s time to discover your identity and embrace it! Many of the greatest people in history stood on foundations forged with service. They put the needs of others before their own. They gave of their time, sustenance, gifts, and talents. They understood what has escaped those caught in mediocrity’s grasp. They discovered a need and dedicated most their lives to meeting a need that served others. They not only met needs but they also created something that most of us desire. Through their service, they created legacy. When you create legacy, you step into something amazing. You create exponential illumination that ignites destiny’s power!